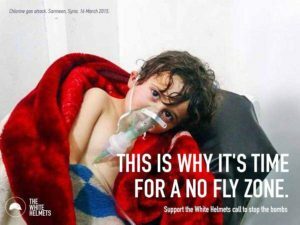 With the latest hasty judgment about Tuesday’s poison-gas deaths in a rebel-held area of northern Syria, the mainstream U.S. news media once more reveals itself to be a threat to responsible journalism and to the future of humanity. Again, we see the troubling pattern of verdict first, investigation later, even when that behavior can lead to a dangerous war escalation and many more deaths. Before a careful evaluation of the evidence about Tuesday’s tragedy was possible, The New York Times and other major U.S. news outlets had pinned the blame for the scores of dead on the Syrian government of Bashar al-Assad. That revived demands that the U.S. and other nations establish a “no-fly zone” over Syria, which would amount to launching another “regime change” war and would put America into a likely hot war with nuclear-armed Russia. Even as basic facts were still being assembled about Tuesday’s incident, we, the public, were prepped to disbelieve the Syrian government’s response that the poison gas may have come from rebel stockpiles that could have been released either accidentally or intentionally causing the civilian deaths in a town in Idlib Province. One possible scenario was that Syrian warplanes bombed a rebel weapons depot where the poison gas was stored, causing the containers to rupture. Another possibility was a staged event by increasingly desperate Al Qaeda jihadists who are known for their disregard for innocent human life. While it’s hard to know at this early stage what’s true and what’s not, these alternative explanations, I’m told, are being seriously examined by U.S. intelligence. One source cited the possibility that Turkey had supplied the rebels with the poison gas (the exact type still not determined) for potential use against Kurdish forces operating in northern Syria near the Turkish border or for a terror attack in a government-controlled city like the capital of Damascus. 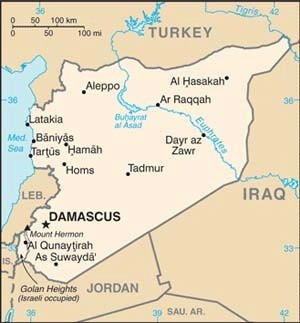 Reporting by investigative journalist Seymour Hersh and statements by some Turkish police and opposition politicians linked Turkish intelligence and Al Qaeda-affiliated jihadists to the Aug. 21, 2013 sarin gas attack outside Damascus that killed hundreds, although the Times and other major U.S. news outlets continue to blame that incident on Assad’s regime. On Tuesday, the Times assigned two of its most committed anti-Syrian-government propagandists to cover the Syrian poison-gas story, Michael B. Gordon and Anne Barnard. The controversial map developed by Human Rights Watch and embraced by the New York Times, supposedly showing the flight paths of two missiles from the Aug. 21 Sarin attack intersecting at a Syrian military base. Gordon has been at the front lines of the neocon “regime change” strategies for years. He co-authored the Times’ infamous aluminum tube story of Sept. 8, 2002, which relied on U.S. government sources and Iraqi defectors to frighten Americans with images of “mushroom clouds” if they didn’t support President George W. Bush’s upcoming invasion of Iraq. The timing played perfectly into the administration’s advertising “rollout” for the Iraq War. Of course, the story turned out to be false and to have unfairly downplayed skeptics of the claim that the aluminum tubes were for nuclear centrifuges, when the aluminum tubes actually were meant for artillery. But the article provided a great impetus toward the Iraq War, which ended up killing nearly 4,500 U.S. soldiers and hundreds of thousands of Iraqis. Gordon’s co-author, Judith Miller, became the only U.S. journalist known to have lost a job over the reckless and shoddy reporting that contributed to the Iraq disaster. For his part, Gordon continued serving as a respected Pentagon correspondent. Gordon’s name also showed up in a supporting role on the Times’ botched “vector analysis,” which supposedly proved that the Syrian military was responsible for the Aug. 21, 2013 sarin-gas attack. 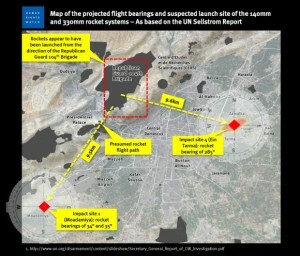 The “vector analysis” story of Sept. 17, 2013, traced the flight paths of two rockets, recovered in suburbs of Damascus back to a Syrian military base 9.5 kilometers away. The article became the “slam-dunk” evidence that the Syrian government was lying when it denied launching the sarin attack. However, like the aluminum tube story, the Times’ ”vector analysis” ignored contrary evidence, such as the unreliability of one azimuth from a rocket that landed in Moadamiya because it had struck a building in its descent. That rocket also was found to contain no sarin, so it’s inclusion in the vectoring of two sarin-laden rockets made no sense. Gordon was a co-author of another bogus Times’ front-page story on April 21, 2014, when the State Department and the Ukrainian government fed the Times two photographs that supposedly proved that a group of Russian soldiers – first photographed in Russia – had entered Ukraine, where they were photographed again. Gordon perhaps personifies better than anyone how mainstream journalism works. If you publish false stories that fit with the Establishment’s narratives, your job is safe even if the stories blow up in your face. However, if you go against the grain – and if someone important raises a question about your story – you can easily find yourself out on the street even if your story is correct. Anne Barnard, Gordon’s co-author on Tuesday’s Syrian poison-gas story, has consistently reported on the Syrian conflict as if she were a press agent for the rebels, playing up their anti-government claims even when there’s no evidence. A heart-rending propaganda image designed to justify a major U.S. military operation inside Syria against the Syrian military. For instance, on June 2, 2015, Barnard, who is based in Beirut, Lebanon, authored a front-page story that pushed the rebels’ propaganda theme that the Syrian government was somehow in cahoots with the Islamic State though even the U.S. State Department acknowledged that it had no confirmation of the rebels’ claims. When Gordon and Barnard teamed up to report on the latest Syrian tragedy, they again showed no skepticism about early U.S. government and Syrian rebel claims that the Syrian military was responsible for intentionally deploying poison gas. 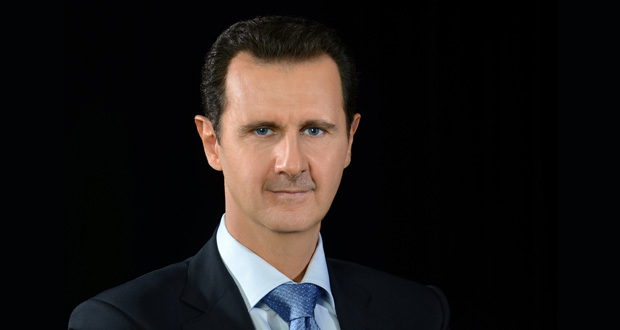 Perhaps for the first time, The New York Times cited President Trump as a reliable source because he and his press secretary were saying what the Times wanted to hear – that Assad must be guilty. Gordon and Barnard also cited the controversial White Helmets, the rebels’ Western-financed civil defense group that has worked in close proximity with Al Qaeda’s Nusra Front and has come under suspicion of staging heroic “rescues” but is nevertheless treated as a fount of truth-telling by the mainstream U.S. news media. The following paragraph mentioned the possibility that a Syrian bombing raid had struck a rebel warehouse where poison-gas was stored, thus releasing it unintentionally. But the placement of the response was a clear message that the Times disbelieved whatever the Assad government said. At least in the version of the story that appeared in the morning newspaper, a government statement was moved up to the sixth paragraph although still surrounded by comments meant to signal the Times’ acceptance of the rebel version. But they again ignored the alternative possibilities. One was that a bombing raid ruptured containers for chemicals that the rebels were planning to use in some future attack, and the other was that Al Qaeda’s jihadists staged the incident to elicit precisely the international outrage directed at Assad as has occurred. Gordon and Barnard also could be wrong about Assad being the only one with a motive to deploy poison gas. Since Assad’s forces have gained a decisive upper-hand over the rebels, why would he risk stirring up international outrage at this juncture? On the other hand, the desperate rebels might view the horrific scenes from the chemical-weapons deployment as a last-minute game-changer. None of this means that Assad’s forces are innocent, but a serious investigation ascertains the facts and then reaches a conclusion, not the other way around. However, to suggest these other possibilities will, I suppose, draw the usual accusations about “Assad apologist,” but refusing to prejudge an investigation is what journalism is supposed to be about. Another problem with the behavior of the Times and the mainstream media is that by jumping to a conclusion they pressure other important people to join in the condemnations and that, in turn, can prejudice the investigation while also generating a dangerous momentum toward war. Once the political leadership pronounces judgment, it becomes career-threatening for lower-level officials to disagree with those conclusions. We’ve seen that already with how United Nations investigators accepted rebel claims about the Syrian government’s use of chlorine gas, a set of accusations that the Times and other media now report simply as flat-fact. Yet, the claims about the Syrian military mixing in canisters of chlorine in supposed “barrel bombs” make little sense because chlorine deployed in that fashion is ineffective as a lethal weapon but it has become an important element of the rebels’ propaganda campaign. U.N. investigators, who were under intense pressure from the United States and Western nations to give them something to use against Assad, did support rebel claims about the government using chlorine in a couple of cases, but the investigators also received testimony from residents in one area who described the staging of a chlorine attack for propaganda purposes. Now, that dubious U.N. report is being leveraged into this new incident, one opportunistic finding used to justify another. But the pressing question now is: Have the American people come to understand enough about “psychological operations” and “strategic communications” that they will finally show the skepticism that no longer exists in the major U.S. news media?